My children are older now and I run a homeschool group. I still never hesitate to offer Hands On Homeschooling as the best place to start educating at home. The program offers all that a beginner with little ones needs to have a successful year of school. The love and gentleness in the pages of this curriculum are a source of encouragement. The activities blend so well together and the ideas are an inspiration. The peace of mind that one is covering everything needed is priceless as positive routines (Bible everyday) and styles are established. And the fact that time can be spend with the children, rather than on preparation is gold! Thank you so much for what you did for my family! My curriculum arrived yesterday--thank you so much! This will be my first year of homeschooling my four year old son. I have researched curriculums extensively this summer and have to say that yours is by far the best! It is exactly what I am looking for, structured and yet flexible. What a gold mine of activities! I could not be more happy with my purchase. I am impressed with the quality of your work and the product itself. It is beautiful and professionally done. Everything is so well thought out. It really takes the guess work out of teaching. I taught elementary school for six years before staying home with my son and I have never seen such a user friendly curriculum. It is like having a friend by my side telling me what to do step by step. You have truly thought of everything. Amazing!!! As a mom of newborn twins I know that your detailed planning will really help me out. I can't thank you enough! I am so excited to begin this new phase of my life teaching my son at home. Thank you so much for all of the time and effort you put into creating Hands on Homeschooling. It is priceless. I will highly recommend it to everyone I know. I can not tell you how blessed I am with your program. It is so refreshing, simple, and fun! The Lord laid on my heart and my husband's heart that we were to homeschool. But, I am by no means a born teacher! My children are 6 (almost 7), 5 1/2, and 3 (almost four). It can be very intimidating even at their ages! I found a curriculum that I LOVE, but.....they tend to overachieve and my children are not enjoying a lot of it. Too much book work and not enough hands on. So that is exactly what I googled, "Hands on Homeschooling!" What a God thing! Of course your site popped up and my first thought was, "I bet it will be good but not biblical." But, much to my joyous surprise, it was! I am so glad that there are creative people like you that us not so creative types can learn so much from! May God richly bless you and your beautiful family! I purchased your curriculum about four months ago and absolutely love it! We do preschool three mornings a week and the children love “going to school.” I have four children in my classroom and it has been so enlightening to see them grow and develop since I have implemented the curriculum. The best part is hearing them recite their Bible verses. I never imagined that my two year old daughter would be able to recite verses to me. It is so precious! I can’t say enough about the layout of the curriculum and the organization. I am a teacher with a Masters degree in special education so I am very familiar with developing and using curriculum in the classroom. I am very impressed with the Hands on Homeschooling curriculum. The activities are age appropriate and meet a variety of learner’s needs. I am forever grateful for your time and energy with putting this curriculum together. Thank you from the bottom of my heart! I haven't found anything on the market that is as well-put together, easy to follow, uncomplicated to teach, and as fun to do without worrying about if I'm missing something that my child should be learning. HOH is superior and I am so thankful for the hard work and time you've invested into getting it together, especially with three young children in the house! My daughter is a kinetic/tactile learner, so HOH has been right up her alley. I will be sad when she "graduates" out of HOH and we have to move onto something else. HOH has freed me from the stress of figuring out lesson plans, time-consuming curriculum searches of piecing together something that will work for our kids and has allowed me to enjoy the joy of homeschooling. I can't sing the praises of Hands on Homeschooling loud enough! Thank you for making the beginning journey with homeschooling so pleasurable and simple. God bless you and your family. 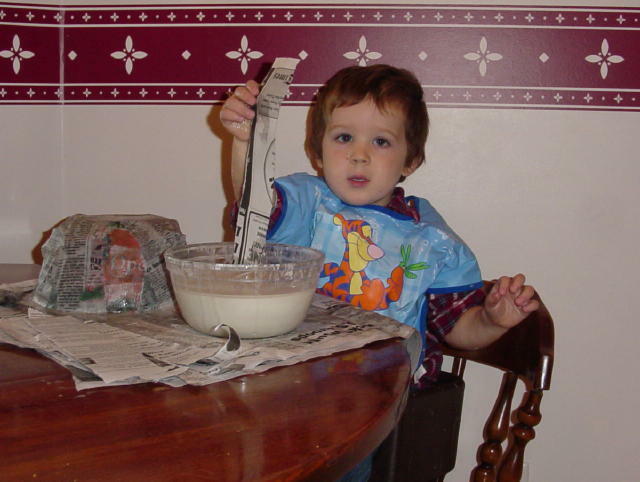 This picture is of my little guy making a paper Mache stable as a part of his December Bible lesson. He loved this project, as he does most all of the things we do in school! Thanks for all of your hard work in putting this curriculum together - we both love it! Terri has done a wonderful job keeping the instructions and lesson plans simple and easy to follow. She has helped build my confidence that I can teach my child. Our 5-year-old stays interested and involved. It is not uncommon to hear, "Let's go do school" at 7:00 am! Whether you are looking at HOH as a home school parent or to simply provide your child preparation for the classroom, Hands on Homeschooling provides a well-balanced foundation for both. My challenge now is to locate a first grade curriculum that compares with what Terri has provided through kindergarten. As a former grade school teacher I am very particular about curriculum. When my daughter turned two I searched extensively for just the right curriculum that would fit us. I found it in, "Hands on Homeschooling." It is a well-rounded curriculum that includes the basics of math and pre-reading as well as social studies, science, field trips, music, cooking and crafts. Three activities a day was just right for her attention span. The Bible lessons are well done. It is very much hands on, the preparation section is excellent, not a lot has to be purchased, and the activities are FUN. Besides the curriculum, additional activities and websites are also included. Best of all, Terri is an email away to answer any questions. She is always prompt and courteous in her responses. My daughter loves to "do school." By starting with this preschool series it will be easier when she begins the primary grades. I was so impressed with it I've already purchased ages 3, 4, and 5. 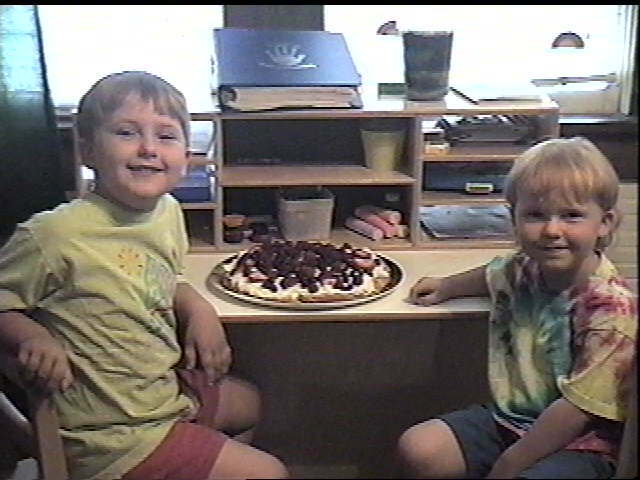 This picture is of my boys getting ready to enjoy their fruit pizza project on their last day of school! We really enjoy your program and find it very accelerated. My boys are working at levels ahead of their friends who are going to private schools. And your program makes it so easy! Oh my gosh Terri! The Curriculum arrived Saturday. I haven't had a chance to read it all the way through, but I am SO IMPRESSED. I have to be honest that I was a bit concerned about the cost ~ however, after receiving the book and looking at all the effort you have made ~ it is PURE GOLD. PURE PLATINUM!!!!! These manuals are a MUST whether someone wants to send their children to public / private school at five or not. The Lord has truly blessed my children and I through you! I just wanted to let you know that I received my books yesterday and Ryan and I started school today. At the end of the summer I will be ordering the 4 year old version and start that in September. We both had a great time this morning and Ryan loved school, so I just wanted to say thanks for all that you do. I know that I was a bewildered mom wondering how I was going to educate my child while adding in Biblical principles, etc. and you have done that and more. He loved relearning how to wash his hands this morning... wow, who ever knew that??? May God continue to bless you in the endeavor to help other bewildered or not so bewildered moms and dads educate their child the way God intended. First, let me say I am totally sleep deprived today; After climbing into bed with the curriculum book last night at 10:30, I was up until about 12:30....I read the ENTIRE year's plan, activity by activity! I have taught 1st grade in the past, and I just wanted to let you know that your plans are so well laid out, so thought out, & very well done. I have sent your link to two other friends in the area who have 3 year olds & are wanting to homeschool next year instead of putting them in a preschool. I am totally sold on your methods & your curriculum, even before doing any of the activities. It is obvious you have spent a lot of time & put your expertise into this curriculum, and I can't wait to show the binder to my two friends. I know they'll be sold too! Thanks again for offering this product. I told my husband last night that I feel like a weight has been lifted off my shoulders. I now have my entire year planned out, and written like true lesson plans...something I felt the need to do (my teacher habits never die! ), but was having such trouble putting all into one place.